Oh yes, we sure love ice cream. Did you know there are now almost 50 homegrown ice cream brands? They've done quite a bit to jazz up the scene with localised flavours like Chempedak, Sweet Potato with Honey & Chestnut, Salt & Pepper, Kaya, Mars Bar & Sea Salt, Chocolate Guinness, Dark Chocolate & Grape, Wasabi, Honey Lemon, Bandung with Attap Chee, and even Curry! Did I forget to mention D24 Durian? 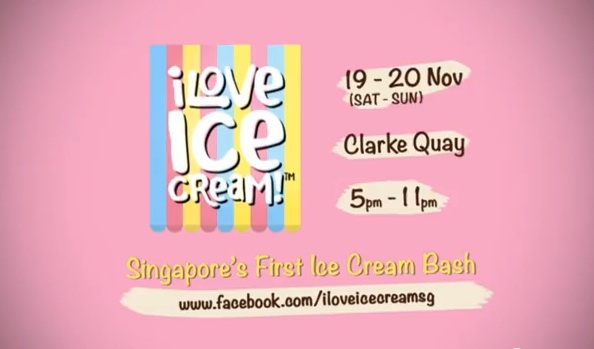 You'll get to sample flavours from 20 of these local shops at Singapore's first ice cream bash happening next weekend (19-20 Nov; 5-11pm) at Clarke Quay. If you are a DBS/POSB cardmember, flash your card for a free scoop. Join in the chili chocolate eating or "guess the ingredient" contests, and check out the ice cream and food pairing competition - what flavour do you think goes best with chili crab or satay?